The Find. Eat. Drink. article is here. and the video is here. Finally got around to trying the Wednesday evening special at Via Emilia last night - $25 gets you 4 pours of Lambrusco and 4 antipasti. Cheap, fun, and delicious. My favorite Lambrusco of the four was the Vittorio Graziano Lambrusco di Castelvetro - a very old school Lambrusco - made the way they used to be made. Very dry with red berry notes (some dinner companions in the past have noted a medicinal quality - which am not sure I get, but I love that aspect of it) - excellent to begin a meal with cured meats (mortadella is a classic pairing). I'd had this a few times and fell in love with it at a dinner held by Gabrio, owner of the De-Vino Wine Boutique in the Lower East Side. It's imported by the folks at Via Emilia and he buys it from them. For $36 a bottle at Via Emilia and $22 a bottle at De-Vino, it's a steal. A couple of years ago when Jorge was managing the wine program at Cercle Rouge in Tribeca, they used to serve Tue-Boeuf Brin de Chevre by the glass. It was a brave move - because beyond some wine geeks who really knows Menu Pineau. But it was an inspired move, at least I believe it was, because it matched perfectly with the goat cheese and onion tart they had on their menu as an appetizer. What a pairing it was: sweet onions, slightly tart goat cheese balanced beautifully with the slightly sweet and bright menu pineau (this was a couple of vintages ago when the Brin de Chevre had a touch of residual sugar). I was buying some wine, back at the old stomping grounds of Chambers Street Wines, and I decided it was time for the Tue-Boeuf 2007 Touraine Le Brin de Chevre. My next thought was Goat Cheese and Onion Tart. Not many people opt to make onion tarts from scratch based on picking up a bottle of menu pineau from the Loire Valley - but maybe I am unique in that way. 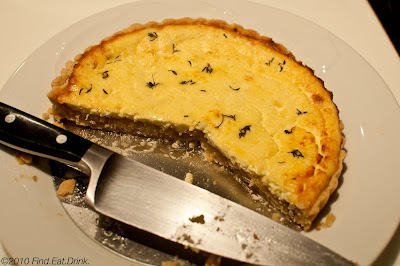 The tart turned out well - although not making pastry from scratch very often, I struggled a little with the dough. I used a recipe from Gourmet, September 1997 with some adjustments along the way. I made a smaller round pie (8 inch pie tin) and used less goat cheese than called for - not by choice, but based on what I had purchased. 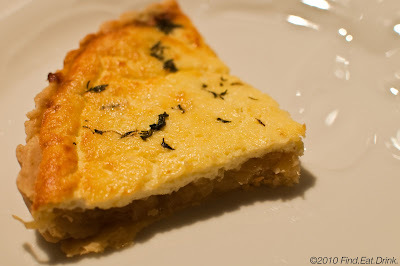 Still, the pastry was flaky, the onions really sweet, and the topping crisp and cheesy. And it was even better cold the next day. And the wine? Just what I wanted: dry, crisp, apples, citrus, floral, elegant and interesting. A brilliant pairing with the goat cheese and onion tart. I was inspired by Shrove Tuesday again this year and made some savory pancakes (crepes really). 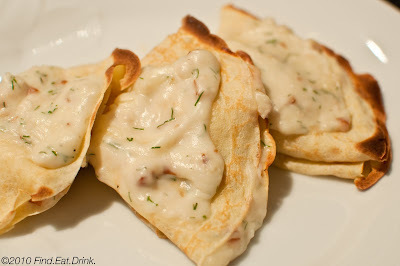 The pancakes were stuffed with a bechamel sauce with chopped honey smoked sturgeon, fresh dill, and both cheddar and parmesan cheeses as well as small smoked shrimp. It was a really unbelievable lunch.